Today is my first day of the Welfare Food Challenge. Luckily our food budget is solely for food. 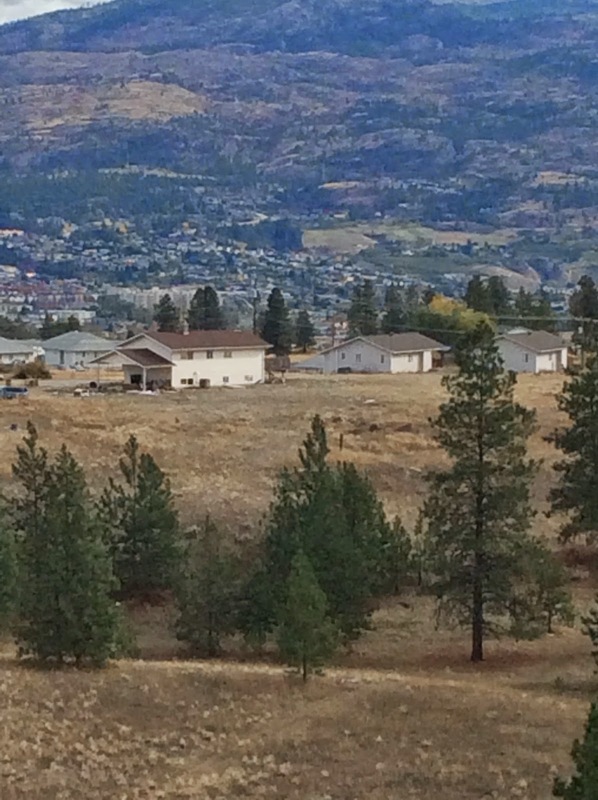 As you can see in the first photo, although the Penticton Indian Band community is close to town compared to many other reserves in BC, it is still about a 10K drive. On check day, some members who cannot access rides to town from family will pay $30 one way for a cab ride to town to buy groceries. It would take an hour and a half or so to walk. Taking the good advice from one of my former workshops on food budgeting I had reviewed the on-line store flyers to see if there were any good deals. 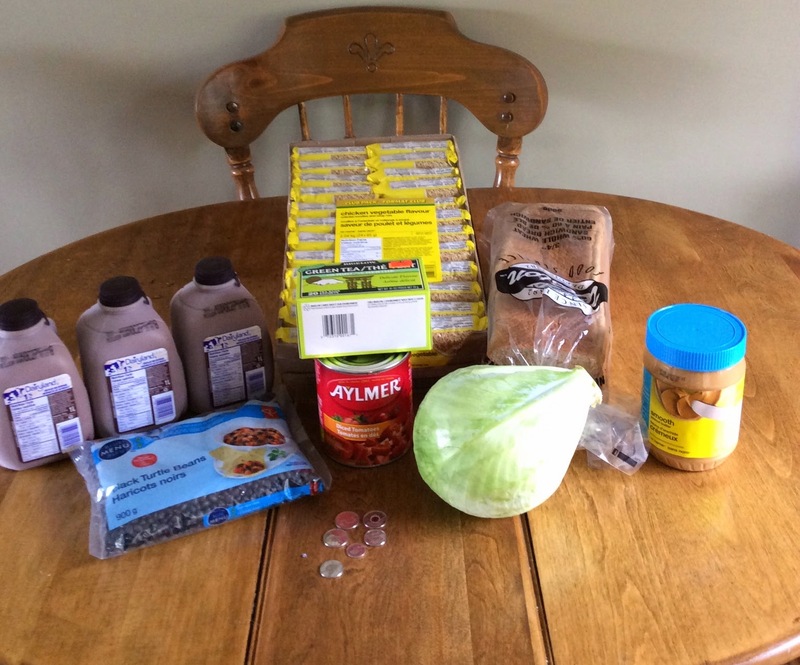 I ended up finding a good price for the cabbage and the chocolate milk, so it was worth it. All said, I went to four different stores. This was very reminiscent of my grandmother, who has been gone for like twenty five years, but when she went shopping she would drive from grocery store to grocery store buying only their best specials. I used to giggle at that and wonder if she spent more on gas than she saved, but she was known for always having something to feed people when they were hungry and sometimes people would come to her place looking for work in exchange for food even. 1) MTF Outlet Store – 1 Box of Green Tea for $1.45 – SCORE! I immediately felt better just knowing that I had caffeine on my menu. About a week ago I posted on FB about the challenge and a few comments that were shared made reference to the fact that for many people welfare is an ongoing reality and that many factors play in to this scenario including the need to manage for addictions. Caffeine is most definitely my addiction. 2) Superstore – Cabbage was 38 cents per pound ($1.26) and a 1kg jar of peanut butter for $3.58 (low salt but full of sugar and hydrogenation, the natural peanut butter was about $6). 3) The Real Canadian Wholesale – I had actually pre-shopped here last week and determined that it was the best location for ramen noodles case of 24 for $4.79. I scoped out macaroni but it was going to be too expensive and too bland. I then picked up a 900 g bag of dried black beans 2.99 (I paid 50 cents more for it than I thought I was paying … hmmm) and a loaf of bread 900g for $1.97. 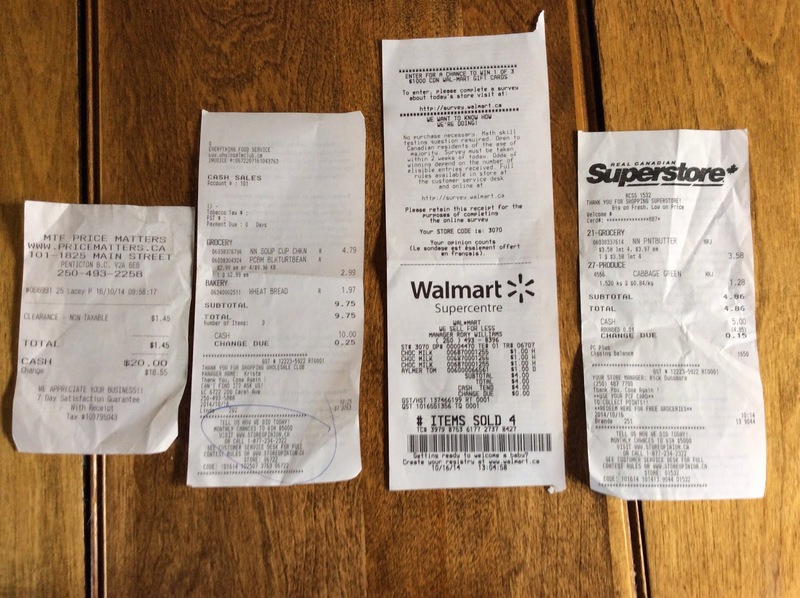 4) Walmart – Another good flyer find here. Litre size jugs of chocolate milk were only a dollar (no deposit and no tax). I love chocolate and milk is an actual food group. I also picked up a can of tomatoes. This left me with 95 cents left over, there wasn’t anything I could possibly get for that little at Walmart, so I am saving it for a treat of some sort later in the week. By about 11:00 am I got to eat my first meal of peanut butter and toast and have a cup of tea. I made up for lost meals after this and despite having my ‘caffiene’ I felt considerably dopey at my evening meeting to which a lovely elk stew, salad and home baked cake was catered for dinner. Too bad I had to miss out on that.